Fairfield House and Gardens Guest HouseFairfield House is a late Georgian House which has been tastefully adapted as a guest house. Tony and Liz try to create a calm friendly atmosphere where guests can relax during their stay. For this reason we are not able to accommodate young children. We are pleased to be able to accept dogs in certain rooms with an extra charge, please contact us first before booking to ensure that the room you require is suitable. New deluxe rooms have spa baths with a choice of two different experiences. The relaxation room, room 2, is overlooking the garden and has a sleigh bed, a 2-person massage shower and an internally lit, air-spa bath right next to a window also overlooking the gardens. 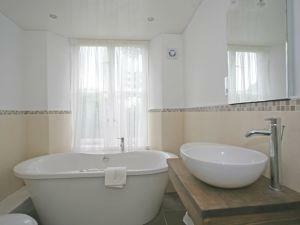 For a complete relaxation experience why not enjoy a glass of champagne together in the bath. For a more invigorating experience try a whirlpool bath with internal chromatherapy this room has a modern solid oak 4-poster bed. Both of these rooms also overlook the garden, For the ultimate in modern convenience our new penthouse in the roof space is a completely open plan area which has views in all directions of the surrounding countryside. The air-conditioned room features a super-king size bed and a comfortable seating area with two flat screen televisions and a DVD player with surround sound. The room also features an air-spa bath and a rain shower built into a window space giving the feeling of being out on the roof. The room is lit entirely by computer controlled LED lighting. We have a large guest lounge adjacent to the terrace with a license and a log fire in winter. Free Internet with wireless access is always available. Rooms are normally available from 14.00 and check-out time is 10.30. Arrival after 17.00 is not normally a problem though it is useful if you let us know your best estimate of arrival time. The house has a large garden which guests are welcome to explore. During the summer croquet and other lawn games may be laid out. Overlooking the garden is a large terrace with seating provided. The village of Bowness includes the waterfront of lake Windermere and it's associated attractions. The village also has pubs, restaurants, shops and night clubs all of which are walking distance. A public pool with 'quiet' swimming available is located just 1.5 miles away. Children welcome from age 10. Fairfield House and Gardens sometimes limits bookings to 2 or more days. Arrive to Windermere from the main A591 road, or if coming by train or coach. From railway/coach station pick up a taxi and ask for The Fairfield, the fare should be about £4. By car follow the road through Windermere town and on down to Bowness where the waterfront is, a journey of about 1 mile. At the centre of Bowness is a mini-roundabout, go straight over and take the first left infront of Rumours restaurant. Take the first left again very quickly this time in front of the Spinnery restaurant. You are now in Brantfell Road and we are just 200yds on the right. Property is on the side of Brant Fell. The access from the village of Bowness is steep and so a car or taxi is required for guests with walking difficulties.